I have only become aware of the joys, delights and therapeutic value of a garden in recent years. 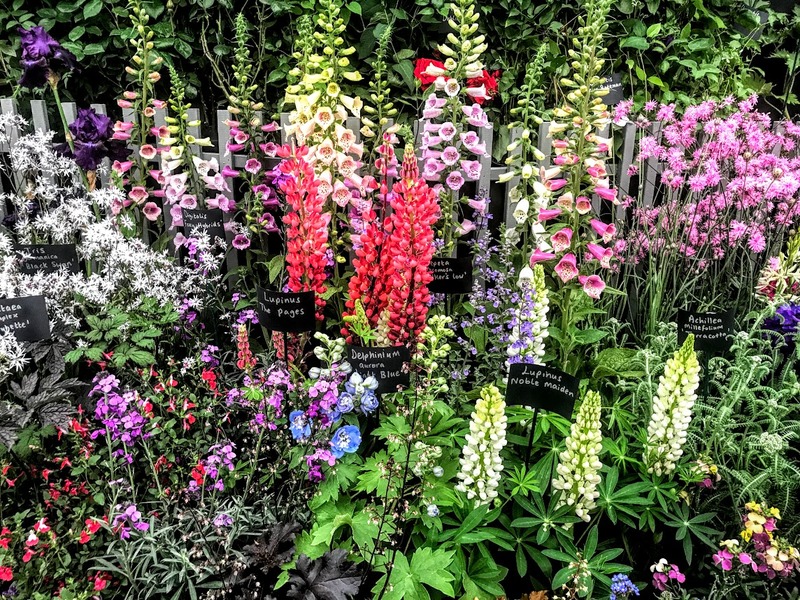 For many years, I could say quite bluntly that I do not do gardens … nor do I do garden centres. Then, I found I was slowly changing my mind. I first went to the Botanic Gardens in Glasnevin to see the architectural engineering involved in building the Victorian glasshouses. I found myself enjoying a garden centre in Virginia, Co Cavan. And now I truly appreciate the work of kind parishioners who maintain the gardens at the Rectory in Askeaton, making it a place of solace, quiet, retreat, and a place to read and work quietly in these summer days. I have been in Dublin for these two days for a hospital appointment and to see my GP, and quite by accident, through the kindness of a friend of a friend, I found myself at the opening day of the 12th annual Bloom, the gardening and food festival in the Phoenix Park, yesterday afternoon [31 May 2018]. This was a completely new experience for me, and one I had never planned intentionally. Bloom was launched in 2007 to provide a showcase for garden plants, garden design, construction, horticulture and gardening as a hobby. 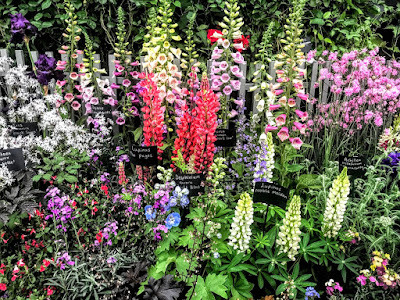 It was based on similar successful formats such as the RHS Chelsea Flower Shows and RHS Hampton Court Palace shows. Since then, Bloom has seen many highly creative garden designs and plant displays that have inspired and excited the public. Bloom takes place in 70 acres in the heart of the Phoenix Park and is as much a food and drink show as it is a garden show. Food lovers meet top food and beverage producers, with insights into Ireland’s food industry, and sampling and buying the best of Irish food and drink. 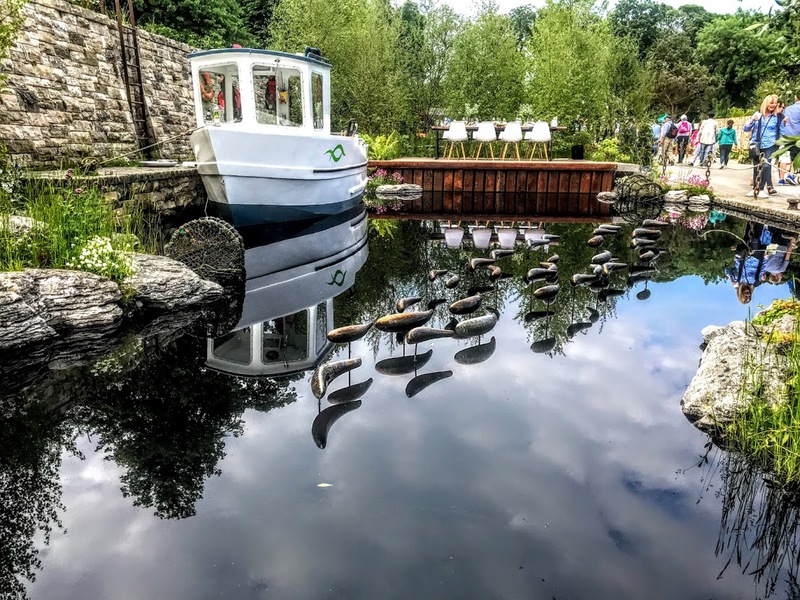 This year’s overall winner at Bloom is ‘The Sustainable Seafood Garden’ by Andrew Christopher Dunne, who lives in the coastal fishing village of Clogherhead, Co Louth. He has been creating high-end, exclusive gardens for almost 20 years, and who is one of Ireland’s foremost garden designers. His ‘Sustainable Seafood Garden’ tells the story of the journey from tide to table of Irish fish and seafood. His garden features two piers, one traditional and one modern. Moored to one of these piers is ‘Sustainability,’ a fishing boat with a difference – it also doubles as a kitchen that is playing host to some of Ireland’s top seafood chefs, preparing sustainable seafood dishes. 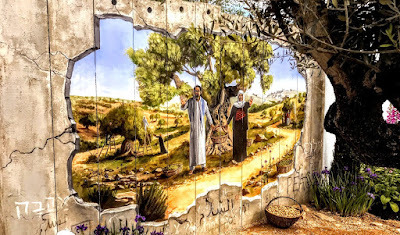 Two other gardens that caught my imagination yesterday afternoon were one with a promise of Greece and one that challenges the Wall that separates many Palestinians on the West Bank from their own gardens. The garden ‘Mamma Mia! Here we go again’ is the work of Tünde Szentesi, a Bloom multi-award winner who moved from Hungary to Ireland in 2006 to pursue a new career in gardening. 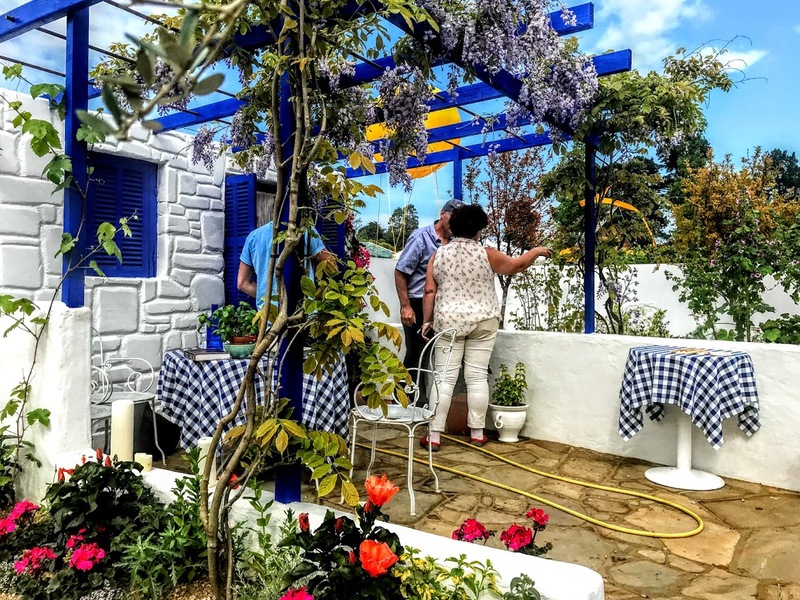 Her garden creates a scene in which visitors can get ready to sing and dance, laugh and love all over again in advance of Universal Picture’s release of Mamma Mia! Here we go again in cinemas next month [July 2018]. Tünde Szentesi has created a Greek-style garden inspired by ABBA songs. 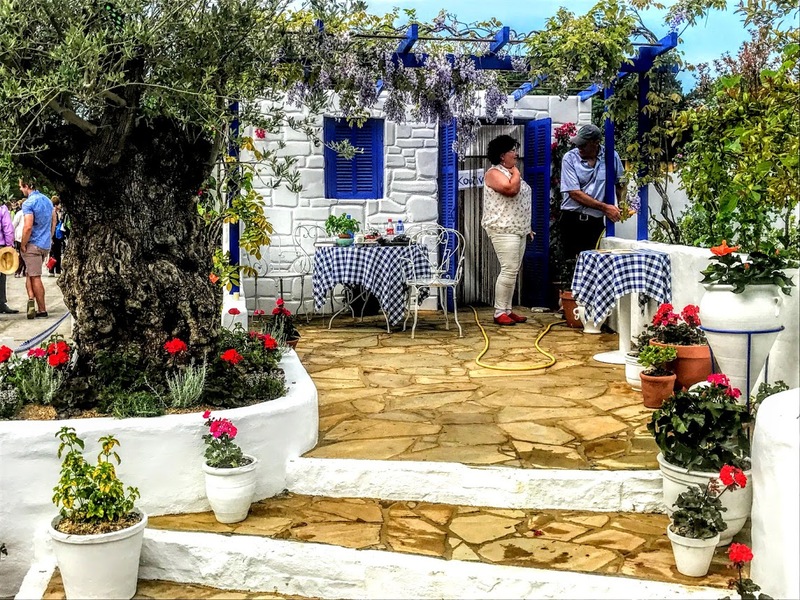 Her garden captures the exotic location of Kalokairi with its beautiful landscape and Greek architecture, including the famous Hotel Bella Donna. She uses Greek architectural elements, including white stone walls, patios, blue painted wooden doors and windows, alongside a bougainvillea and vine pergola with olive trees, figs, potted red geraniums and aromatic herbs, so that visitors are transported into the magical world of Mamma Mia. The olive tree in her garden is over 450 years old, and the garden made me wistful for my visit to Crete next week. Barry Kavanagh’s ‘Garden for Trócaire’ presents the plight of Defenders of Human Rights and the Environmental in Guatemala, Honduras, Zimbabwe and Palestine. It offers a platform for Trócaire to engage with visitors about its work with Human Rights Defenders and the fact that last year alone , 188 people were killed while they defended their rights and the rights of others. Barry Kavanagh is from Bailieborough, Co Cavan, and teaches horticulture and design with the Cavan-Monaghan Education Training Board. His garden is divided into four primary areas of geographical representation: Palestine, Guatemala, Zimbabwe and Ireland. His garden includes art by Ciaran ‘Yohan’ Brennan, including a mural representing Trócaire’s work in Israel and Palestine and a sculpture of a young boy with scorched tree trunks as legs. A digital screen depicts people who have been killed lives while defending human rights and environmental rights. 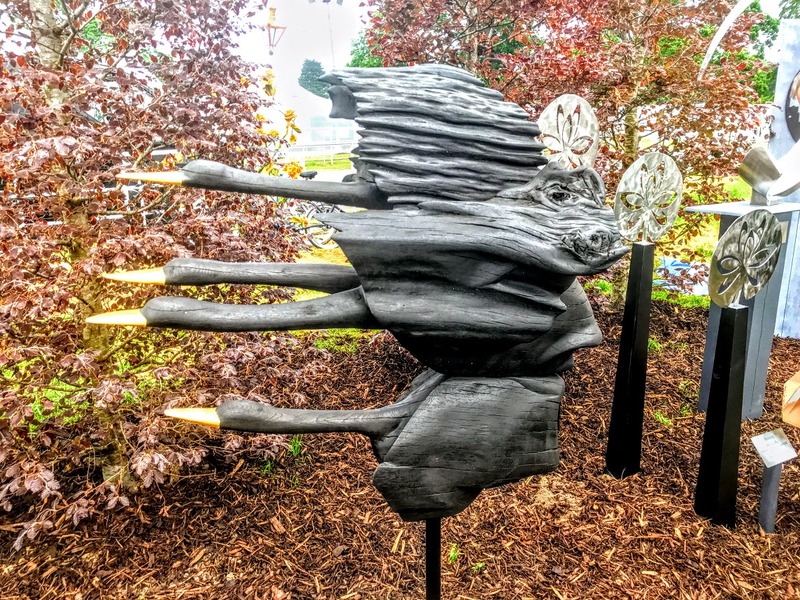 In addition, the 2018 Bloom Sculpture in the Park garden installation offers visitors an opportunity to walk through and interact with some of the best of Irish outdoor art in a garden-style setting. This section includes new and previously unseen works by over 40 leading Irish artists, including Orla De Brí, Stephanie Huss, Bob Quinn, Anna Campbell, Ray Delaney and Liam Butler.